It's football season! Finally, it's time for Saturday's spent at the stadium, tailgating, cooler weather, sweatshirts... the list goes on and on, I love fall. While summer is full of fresh fruits and vegetables, sunshine, and pool time, it also requires (at least in my world) air conditioning and bug spray. While summer is great while it lasts, by August I'm always impatiently waiting for fall to make an appearance. 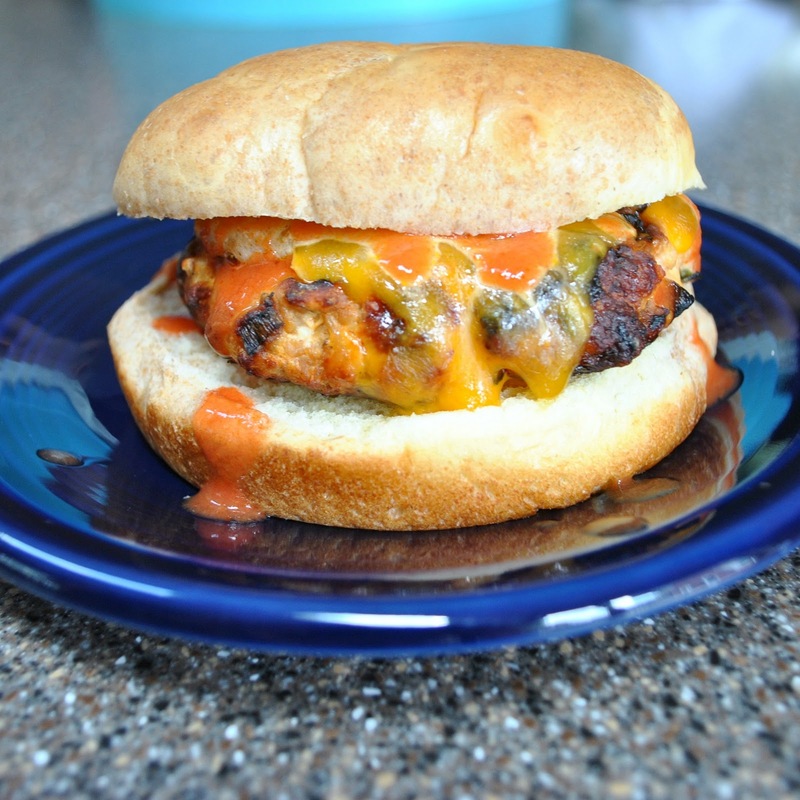 To kick off the home football season this year (sort of, technically I missed the first game - college football shouldn't happen on Thursday nights) I brought buffalo chicken burgers to our tailgate. These burgers were pretty tasty - so much so in fact that I made them again just a couple nights later. Full disclosure - the speediness was partially so I could take the picture that I forgot to take in the parking lot but it was also at the request of my husband. For tailgating, I made these as sliders (aka mini burgers) but at home I made them full size. Take your pick, although I prefer the sliders, just because they are more fun in my opinion. In my mind there are two choices for condiments when it comes to buffalo chicken, ranch or blue cheese. If you side with me on this one, top your burgers with a dollop of ranch dressing and a slice of cheddar cheese. If you disagree, top them with some blue cheese crumbles and blue cheese dressing. Prepare grill to medium heat or preheat a cast iron skillet if cooking indoors. If you are using day old bread, quickly tear into chunks and pulse in a food processor to make crumbs. In a large bowl, add all of the burger ingredients and gently mix until just incorporated. (Don't skip the egg and breadcrumbs, they will really help the patties stay together.) Form into four patties for full size burgers or eight small patties for sliders. Make each patty slider larger than the bun and slightly thinner in the center (this is more important for full size burgers.) Cook finished patties about five - seven (three to four for sliders) minutes per side (you want these cooked all the way through since it's poultry and not beef but don't overcook them or they will be dry), flip once and cook through. Just before the finished, top with cheddar slices if desired. Serve on hamburger buns topped with condiments of your choice. Sounds perfect! Add some cabbage/cole slaw for crunch! Yummy! Lovely!! I can't wait to try these! You have just become my new favorite person. Oh my god I'm in love.